Detectives say three men involved in a shootout that wounded two Los Angeles County sheriff’s deputies were gang members. Sheriff’s Lt. Scott Hoglund says the deputies were wounded Wednesday evening while responding to calls that three men in a car were pulling up to people and asking what gang they were in while brandishing a gun in an East Los Angeles park. When three sheriff’s cars arrived, Hoglund says the black BMW stopped, and the driver got out and began shooting at deputies. Authorities said 18-year-old Fernando Cruz was in critical condition, and 18-year-old Hector Martinez was booked on suspicion of attempted murder. It’s unclear if he has an attorney. Both deputies are expected to survive their wounds. 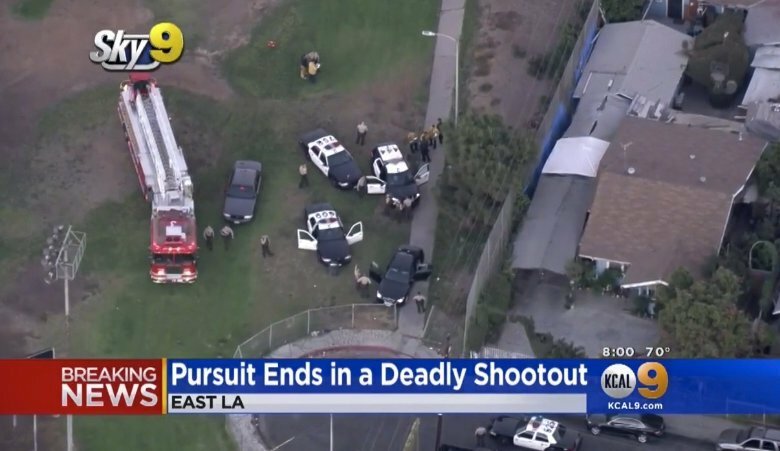 Homicide detectives are investigating the scene of a gunbattle that wounded two Los Angeles County sheriff’s deputies and left a suspect dead. The Sheriff’s Department says the vehicle went into the park, abruptly stopped and one person jumped out and opened fire.